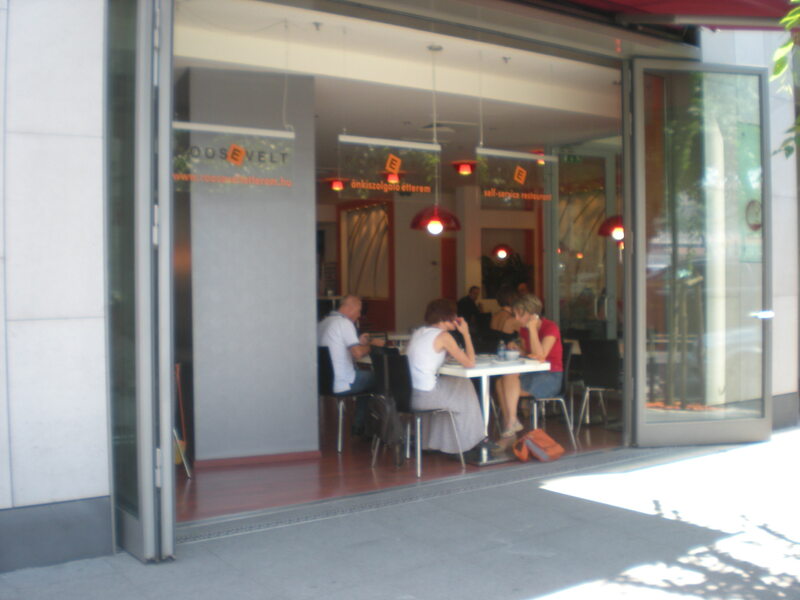 Budapest is a city of cafés. No matter where you’re rolling to, you’ll always find a place to eat, have a kavé, watch the other people finding their way through the city, eyes to the river, to the newspaper, to the camera lens. There’s comfort in taking the time to sit down somewhere and be still. And I’m not romanticizing café culture here. It’s just how here is. I just returned from a leisurely lunch at the Roosevelt Etterem across the Lánchíd and from the Magyar Tudományos Akadémia (the Hungarian Academy of Sciences) in Pest. 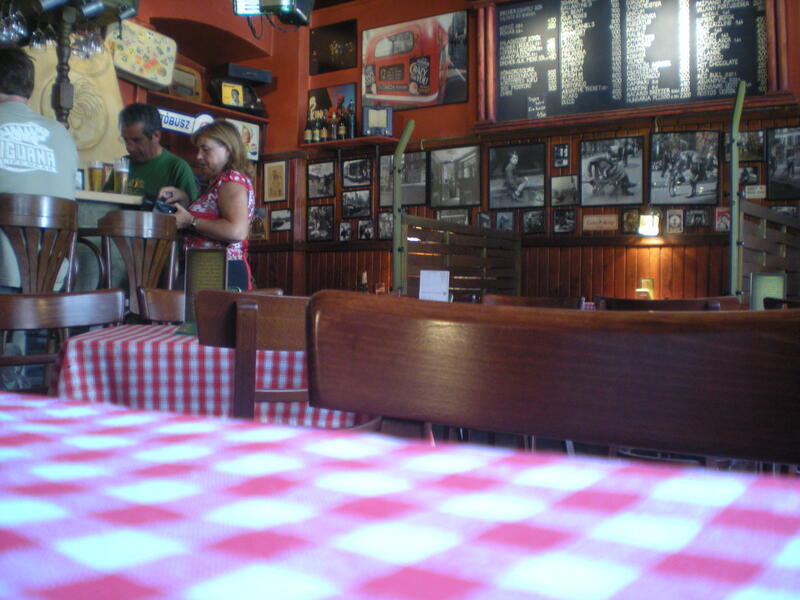 It is a self-service place with good food that seems to serve the business lunch clientele. In my gorilla-like haste to eat, which I justify as being brought on by a 5:30am run this morning and therefore early onset lunch starvation, I didn’t think to make the plates of food look bloggie. But you can see some of the food here, on flickr. After lunch it was one last stop for a cappuccino at the Lánchíd Café across the river in Buda. Perhaps it wasn’t the greatest idea to have a hot beverage when the temperature is nearing 35 C, but it gave me the energy to propel myself back up into the castle so I can sit here typing this now. See what I do for you, my darling Internet. Ok. Now I lived in Indiana for almost six years. I’m no stranger to racing, nor race fans, so when I saw on several occasions Formula One described as glamorous, an event that has driven ticket sales for this Formula 1™ ING Magyar Nagydíj over 400 Euros a day and has booked (and pre-paid) nearly every luxury hotel in the city, I was naturally suspicious intrigued. After all, my own auto racing image catalogue begins at Busch Light and ends at confederate flag bikini. Yep. Reads like every Memorial Day weekend at the Indianapolis Motor Speedway to me. So even though race weekends are often studded with a lot of fun surrounding the actual race, which I still can’t believe anyone would actually pay to attend, I’m still not exactly sure what I’ll be doing. It’s certainly one of the best scenes for photographers, street talk bloggers, sight seers, and narrative poets, so you may just find me in the city center taking a few things down. Then again, there is the Központi Vásárcsarnok (the central market) yet to explore, the Pálinka Festival in Nagykunság, and that inviting whisper of Slovakia just around the river bend. Too bad more American cities aren’t organized in this way. I think that the price of gasoline is going to spark a movement back to our cities, away from the suburbs. Would be nice if we give some thought to making the cities fun — and livable.